The Cabildo, a very old and historic building located adjacent to Saint Louis Cathedral, is the home of the Louisiana State Museum. The current structure dates back to the late 1700s, and served various government purposes until the early 1900s, at which time a group of concerned New Orleans citizens saved it from proposed destruction, and it was subsequently designated to become the home of the museum. It was heavily damaged in a 1988 fire, but was fully restored and reopened six years later. This wedding ceremony took place in the second floor gallery of the building, which overlooks Jackson Square. 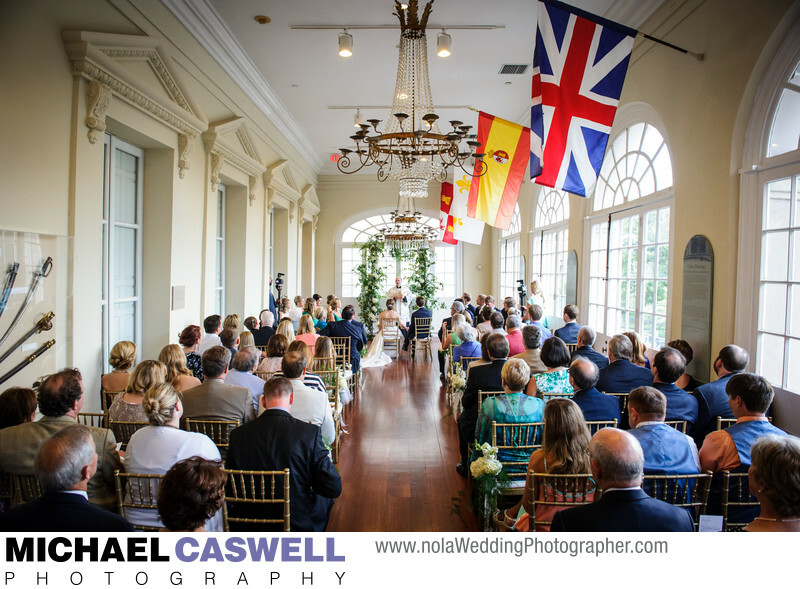 The elegant architectural details, high ceiling, and majestic flags on the wall, along with the massive arched windows that allow glorious daylight to stream in, make this spectacular and unique New Orleans wedding ceremony venue a pleasure to photograph in. Wedding ceremonies at the Cabildo can be set up with the aisle running down the length of the room as seen this image, or alternatively can be arranged so that the bride and groom are instead positioned in front of the center window of those that face Jackson Square (which are along the right side of this photo). This particular couple's wedding was especially interesting as it was the only ceremony featuring a full Catholic mass that I've ever photographed that didn't take place in an actual church. Location: 701 Chartres St, New Orleans, LA 70130.